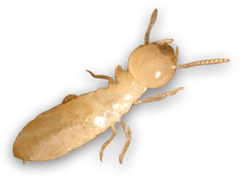 In the southern region of the United States we deal Formosan termites.The Formosan subterranean termite, Coptotermes formosanus Shiraki, is one of the most destructive termite species in the world today. In the United States it causes tremendous property damage resulting in enormous treatment and repair costs. It is sometimes referred to as the "Super Termite"
Subterranean termites are social insects that live in colonies that may contain millions of individuals. Each colony contains three forms or castes, which are workers, soldiers, and reproductives. Large numbers of winged termites swarming from wood or soil often are the first obvious sign of a nearby termite colony. Termite Control Treatments can be done with Liquid Termiticides, Termite Bait Stations, or a combination of both. Liquid Termiticides are fast acting, can be applied closer to the infestation, require less maintenance, and require small to no ongoing costs. There are repellent and non-repellent products on the market today. Termite Bait Systems are less intrusive, no drilling or trenching is needed, no expensive equipment is required, and bait systems can help you identify a problem before the termites reach your home. Termite work can become complicated depending on the situation and the type of termite you are dealing with. You can do your own termite work with the proper knowledge and equipment, we can help!